SUBTITLE – More on Global Warming or NOT…. The mild temps over the last couple of days have turned what was “pretty” snow into more of what you’d expect to see as the calendar closes in on April 1st. The great news is that there is still PLENTY of good base snow across the six resorts that will play on this last weekend of the 2018-2019 ski and snowboarding season. 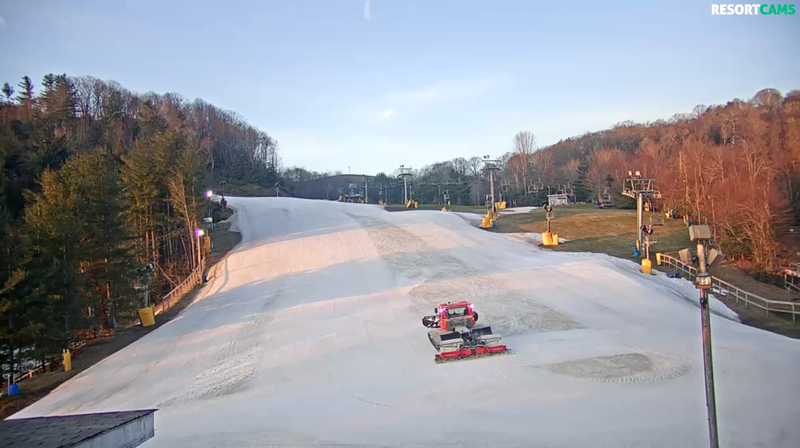 Cataloochee Ski Area – I watched as they were cleaning up the snow this morning with some great grooming. Cat had not posted their latest slope opening for today, however I would resume they will have the same 13 of 18 trails open for Friday. 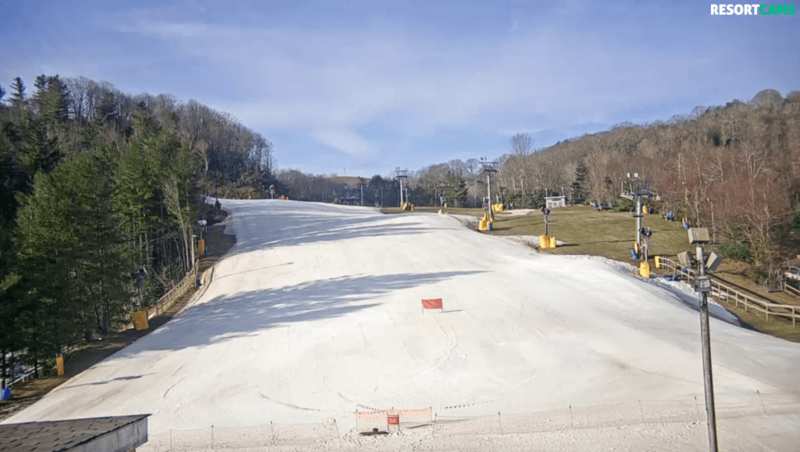 If you didn’t catch the update/announcement late on Thursday, Tammy Brown did share that Cataloochee will, indeed close for the season on Sunday at 4:30pm. You won’t see a better illustration of “snow maintenance” than the two photos below, captured this morning. Snowshoe Mountain – They are still playing strong during March Madness with 42 of 60 slopes and trails open. They posted, “We’re expecting more clouds than sun today, but we should stay dry and temperatures will again reach the 50’s. Tomorrow is looking basically the same as today as far as the weather goes and we don’t anticipate losing any terrain, so make your plans to get up here and join us for the last weekend of the season. 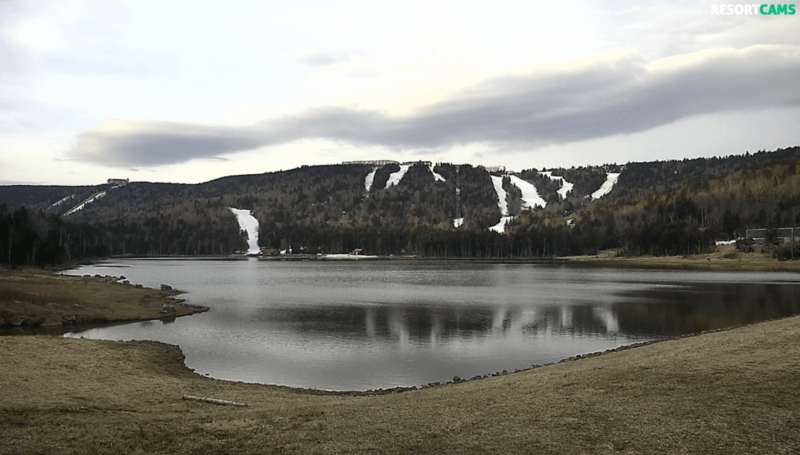 Wisp Resort – First the good news – they are still open with 14 of 34 trails which will keep their fans happy. In a complete turn from what things have been like up there all season long – today is the first time this season that I have seen the temperature at Wisp warmer than anywhere else in the region. They are at 50° and the highs on Thursday REALLY transformed what was “pretty” snow to typical Spring Conditions for this last weekend of the season. That, my friends, IS the SNOW REPORT for your Friday, March 29th, 2019. 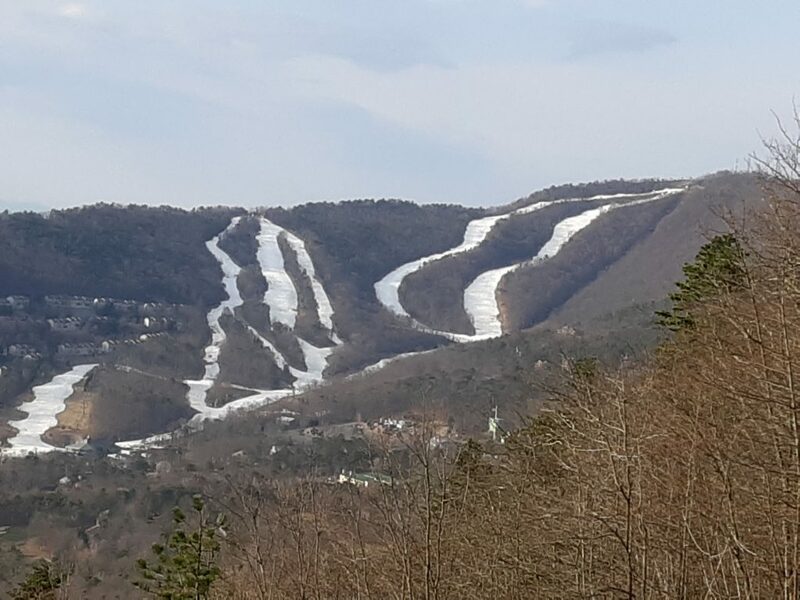 Massanutten Resort – will reopen for Saturday ONLY and they expect 8-10 trails open. Here’s a nice photo from Kenny Hess this morning! Our SkiSoutheast.com traffic has plummeted (down 34% from last week) over these past seven days, as the temperatures climbed – particularly off the mountain – but as late as Thursday we still saw around 12K of you, our more loyal fans/readers/viewers via SkiSoutheast and more via the network. I will put some finishing touches on the FirsTrax news on Sunday AND we have made some commitment to keeping the flow of content coming perhaps once a week or so via SkiSoutheast this off-season. However, we also want to make you guys aware that we will now be sharing some content weekly over on ResortCams.com and HighCountryVacations.com year-round now. 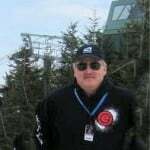 ResortCams.com basically covers all of our mountain communities as well as beach and lake views and HighCountryVacations.com features businesses from all of those same communities from Wisp Resort in Maryland, through all of the West Virginia, Virginia, Tennessee and North Carolina mountains. HighCountryVacations.com also features some travel suggestions and business spotlights as we share the best in lodging, dining, breweries, wineries and more. For the latest information, coming right to your phone or desktop, be sure to check us out on Facebook and Instagram! More on Global Warming…or not…. On Thursday, I mentioned my take on Global Warming or the lack of it, and I only heard from TWO of our closest readers/fans – Bill Nabers and our own David McCue. Admittedly I was shocked that more people didn’t chime in. Perhaps because traffic is “melting” away this time of year. Perhaps more of you rolled your eyes thinking, “there goes Mike again”…and perhaps because many of you agree with me. We love and respect all of our readers and particular Bill and David…but we can respectfully disagree on this subject and hopefully do so without alienating any of our fans. Per the question of WHY I would post information about something as divisive as Climate Change – the answer is simple. There are tons of politically motivated agencies, who are getting millions of dollars in federal grant monies to propagate that agenda. We simply feel the “other side” of opinion needs to be voiced. It really is that simple. I have shared a lot on the subject in previous posts and you can search this website for comments on global warming and/or climate change so I won’t regurgitate them this morning. Herb is also one of the founding fathers and original, on-air personalities of THE WEATHER CHANNEL. Herb sent the email of a story written by good friend, Joe D’Aleo who was THE FIRST Director of Meteorology at THE WEATHER CHANNEL. He is also a meteorologist at WEATHERBELL ANALYTICS. This is one claim that has been repeated for decades even as nature showed very much the opposite trend with unprecedented snows even to the big coastal cities. Every time they repeated the claim, it seems nature upped the ante more. The eastern United States as an example had 29 high impact winter snowstorms the last 10 years. No prior ten-year period had more than 10. 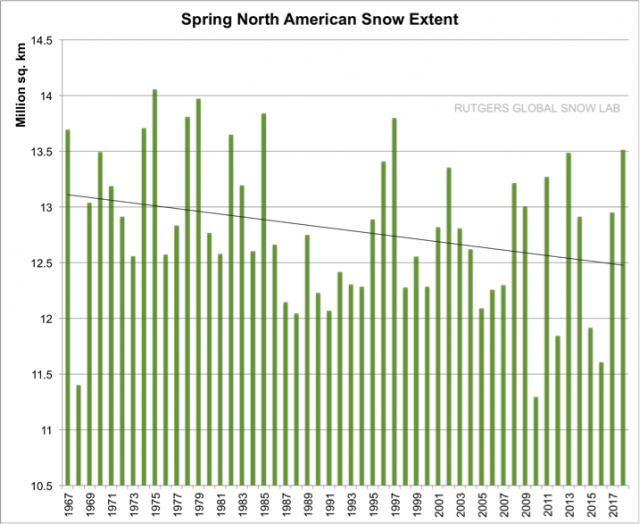 Snowcover in the Northern Hemisphere, North America and Eurasia has been increasing since the 1960s in the fall and winter but declining in the spring and summer. However, as NOAA advised around 2000 might be the case, snowcover measurement methodology changes (automated instead man/machine) at the turn of this century may be responsible for part of the warm season differences. On March 20, 2000, the UK Independent, reported that “Snowfalls are just a thing of the past”. They quoted David Viner of the Climatic Research Unit (CRU) of the University of East Anglia “Global warming was simply making the UK too warm for heavy snowfalls. Within a few years winter snowfall will become “a very rare and exciting event”. “Children just aren’t going to know what snow is,” he said. Similarly, David Parker, at the UK’s Hadley Centre for Climate Prediction and Research, said that eventually British children could have only “virtual” experience of snow via movies and the Internet. In the winters that followed snows fell in the UK and Europe unlike they had seen since the Dalton Minimum in the early 1800s. The IPCC and US government reports through 2007 had projected snows would become much less common as the climate warms especially in the cities. The UCS had a media workshop in the late summer of 2007 on Mt. 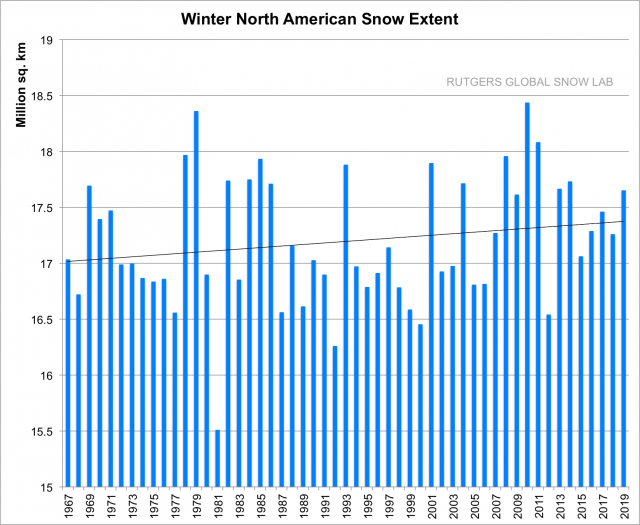 Washington promising a dire future for the winter sports and maple sugar industries That next winter all-time seasonal snow records were set for snowfall in the northeast from Concord to Caribou (and all through the western US up to Alaska). Princeton Environmentalist Michael Oppenheimer and RFK Jr, in 2008 both bemoaned their children in the DC area would never get to enjoy sledding like they did as young in the 1960s. 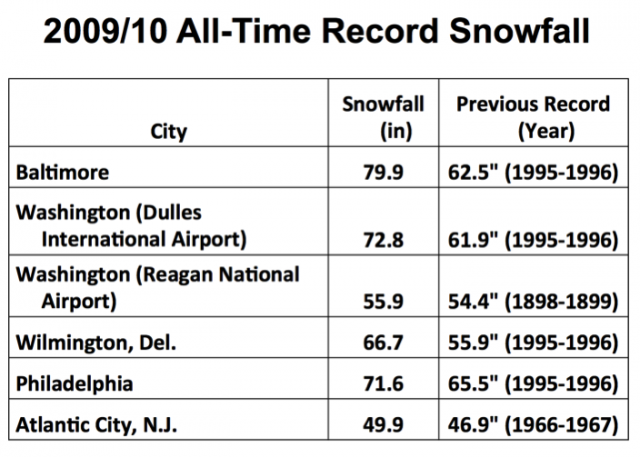 That very next winter, the DC area and the entire Mid-Atlantic had record snowfall in what was called Snowmaggedon. Starting in 2008, the UK and much of Europe and the Northern Hemisphere began receiving snow and cold at levels not seen since the days of Charles Dickens in the 1800s. 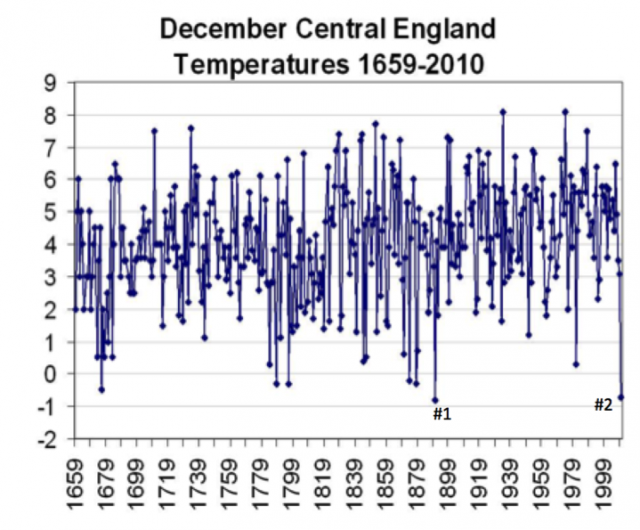 December 2010 in the snow, was the second coldest December in the Central England Temperature (CET) data back to 1659. 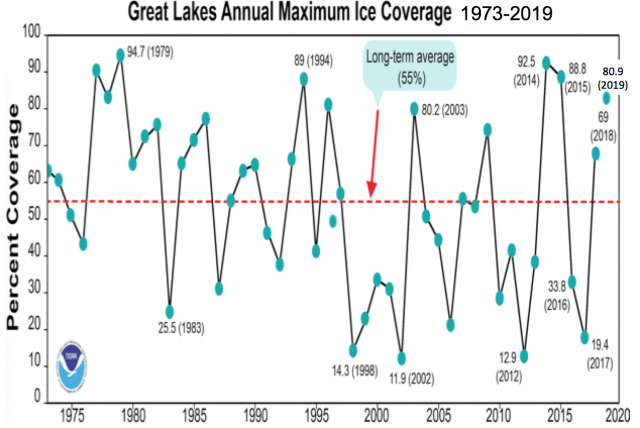 In the United States, the winter of 2013/14 was the coldest and snowiest since the 1800s in places in the Great Lakes. 5 major impacts snowstorms occurred in the northeast. In 2014/15, we had the coldest January to March in the entire record for the 10 northeastern states and the District of Columbia. We broke the all-tie record for snowfall in Boston with 110.6 inches of which 100 inches fell in about 5 weeks. February was the coldest month for many places ever. 5 major impact snowstorms occurred again in the northeast. In 2017/18, the northern states had two brutally cold weeks early with a major snowstorm, then in March four major snows fell. 2017/18 joined 2013/14 and 2014/15 as the only years with 5 such storms in over 6 decades of records. Along the east coast we have seen record setting snow years and 29 major impact snowstorms for the 10-year period ending 2017/18. No other decade had had more the 10. 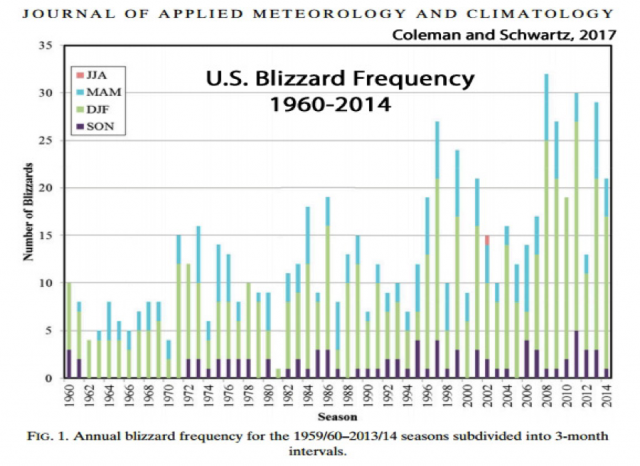 A paper, Coleman and Schwartz, 2017 revealed 713 blizzards over the 55 years with 57 federal disaster declarations resulting. Of these 57 declared disasters, more than a half, have occurred since the year 2000. This published scientific study also found that “seasonal blizzard frequencies displayed a distinct upward trend, with a more substantial rise over the past two decades”. 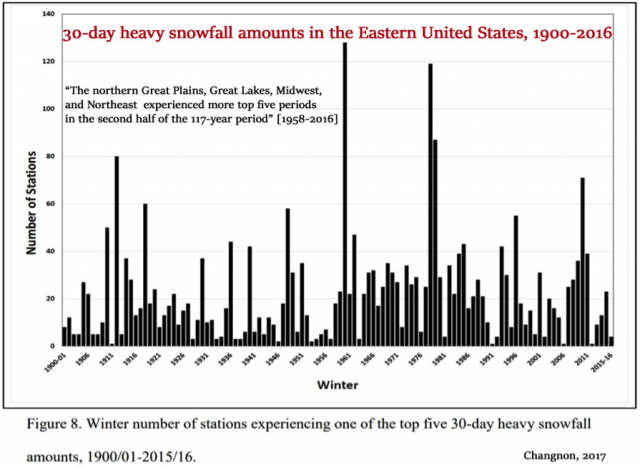 In another publication, Changnon, 2017 evaluated heavy 30-day snowfall amounts east of the Rockies in the United States during the period 1900-2016. The comprehensive data assessment identified 507 stations in this long-term climate study. But the media continues to be oblivious to the real data as the hype machine continues to sell its story despite its past failures. The New York Times had an article in February, 2014 titled ‘The end of snow.’ The article documented how snow soon was going to be a distant memory and our kids would never see it except in news reels. The UCS from the UNH in January 2014 after the winter got off a slow snow start repeated their annual warning about the climate change induced death of the ski and maple sugar industries. But then 2014/15 set records for snowfall in Boston (back to 1872) and many other locations in the northeast into southeastern Canada. In 6 weeks over 100 inches of snow fell in the Boston area with a record 110.6 inches for the winter. It was also the coldest January to March period and in much of the northeast, February 2015 was the coldest month in history. 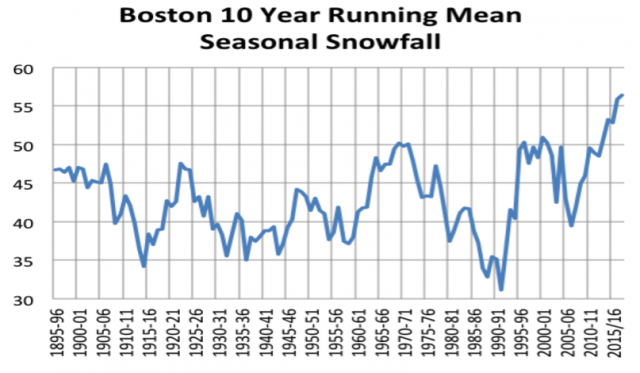 The recent snowy winters has the 10-year running mean snowfall in Boston at the highest in the entire record back to the 1880s and New York City back to 1869/70. It appears that, for the eastern U.S. areas, the 2014/15 winter’s snow blitz may have delivered the most snow since perhaps 1717. That year, the snow was so deep that people could only leave their houses from the second floor, implying actual snow depths of as much as 8 feet or more. The driver for the 2014/15 winter was the same as in the frigid winters of 1916/17, 1917/18, 1976/77 and 1977/78, 1993/94 and 2002/03 – a pool of warm water in the northeast Pacific. Alarmists claimed increased snow is consistent with global warming because warmer air holds more moisture. 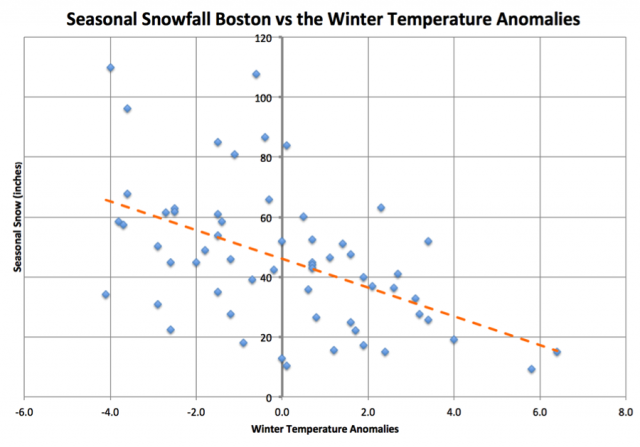 In actual fact, only 1 of the 14 years with more than 60 inches of snow in Boston was warmer than normal. Snow is favored in COLD winters and increases with cooling not warming. In the 39 days in the heart of 2014/15 winter, when Boston had 100.2 inches of snow, the melted precipitation was 5.69 inches, a ratio of 17.6 to 1. Typical snow to melted precipitation ration is 10 to 12 to 1. 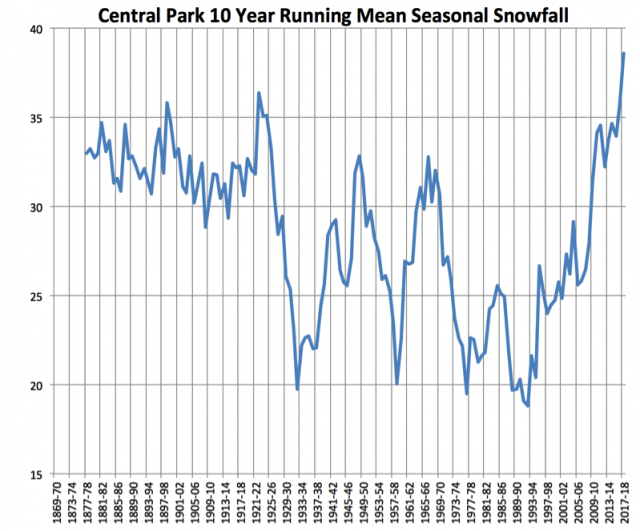 The big snows in recent years have come with unusually cold temperatures. Seasonal snow amounts are high in cold winters, low in warmer winters. They also claimed that snowcover is shrinking especially in the spring and summer. 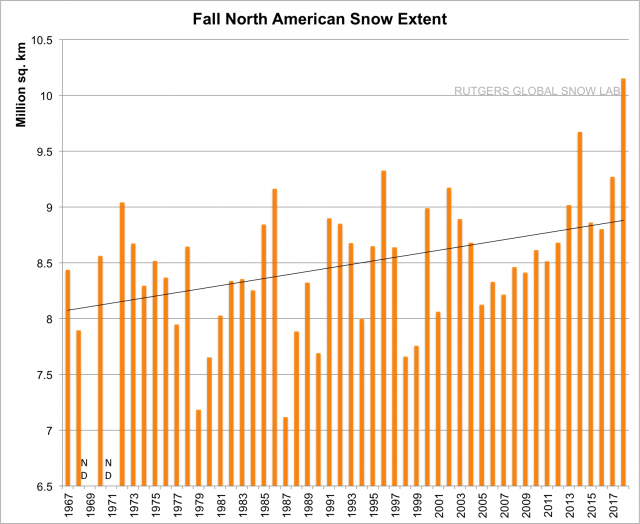 They neglect to mention the snowcover is increasing in the fall in the hemisphere and North America (most ever in 2018, 3rd most in 2017), and increasing in winter again in the hemisphere and North America. Winters continue to trend up. The spring snow extent is diminishing. But some of this may be due to the change in snowcover determination methodology for – from a manual evaluation to an mostly automated albedo (reflectivity) method which in 2000 had NOAA provide a user beware warning on the web site not to compare snow cover in the warmer months to values before 1999. The brightness diminishes as the snow ages, and melts from the canopy of conifers, which disguises the snow beneath. Cold air crossing the Great Lakes produces some of the heaviest snows outside of the major mountains in the lower 48 states. The ice builds on the lakes in cold winters. See how 4 of the last 6 years have ranked above the long-term average with 2013/14 averaging second in 46 years of record keeping. The last two winters were well above normal, 2018/19 ranked 6th.